Keep the greatness of Christ forever close to your heart with this fleurie cross pendant from Apples of Gold. This exceptional piece of jewelry is wrought from radiant 14K white gold for a bright white foundation. The design of the pendant is a silhouette in the shape of a cross. The ends of each arm of the cross are slightly flared for added fashion, and given a crown-like design for a touch of regal style. The entire gold cross pendant is smoothly polished for an elegant finish. 24mm x 18mm (15/16" x 3/4"). 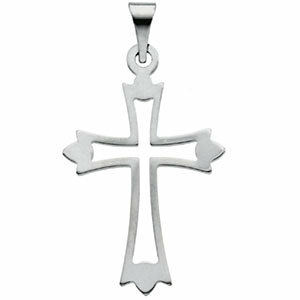 We guarantee our Fleurie Cross Pendant, 14K White Gold to be high quality, authentic jewelry, as described above.